Bobby Hands. Bruno Bayley. Dirrty Glam. DJ Guy. DJ Hand Solo. DJ Quelle Surprise. GabREAL GOLD. Girl U No It's True. Jonathan Rockwell. La Greve Generale. Macy's Gift Card. Non Stop DJs. Still Ill. Team Mega Mix. 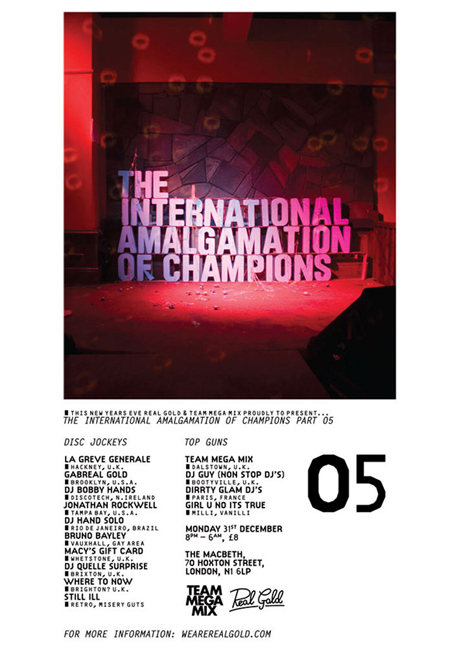 THE INTERNATIONAL AMALGAMATION OF CHAMPIONS. Where To Now.